The Reese & Community Volunteer Fire Company is saddened to share the news of the death of Life Member Thomas H. (Tommy) Brothers who passed away unexpectedly March 15, 2018, at his home. Tommy joined Reese as a volunteer at the age of 18 in July, 1981. 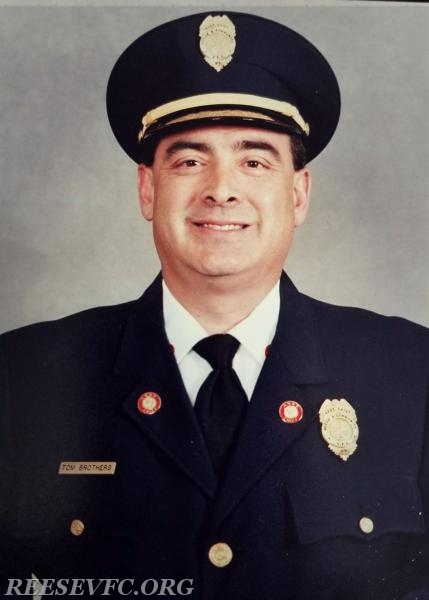 He later went on to become employed as one of our Engineers before joining the Anne Arundel County Fire Department as Career Firefighter in 1987. He retired from AACoFD as a Lieutenant in 2016 after 29 yrs of service. During his 37 years with Reese, he served the Company and Community in many roles as both a Fire Officer and as a member of the Board of Directors. He also owned and operated Brother's Chimney Sweep and Brother's Hearth & Home here in Carroll County for over 25 yrs. The family will receive friends on Sunday, March 25, 2018 from 12 to 4 p.m. at Reese Volunteer Fire Company, 1745 Baltimore Blvd., Westminster, MD 21157. Reese Fire Department will have a service at 3:00 p.m. followed by a funeral service, with Pastor John Morrill officiating. Interment will be private. In lieu of flowers memorial contributions may be made to the Metropolitan Firefighters Burn Center Fund, Inc., 144 Park Road, Pasadena, MD 21155-2924, Mountain Tough Recovery Team, 906 East Parkway, Suite 2, Gatlinburg, TN 37738; MountainTough.org or National Fallen Firefighters Foundation, PO Drawer 498, Emmitsburg, MD 21727.